to more than 20 cities in Canada and the U.S.
Billy Bishop Airport is Canada's ninth-busiest airport and welcomes 2.8 million business and leisure travellers each year. The airport is also Canada’s sixth-busiest airport that offers passenger service to the United States. In 2017, Billy Bishop Airport was named one of North America’s top regional airports by Skytrax World Airport Awards and one of the best airports globally in the under 5 million category. 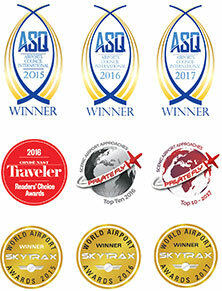 The airport was also named Best Airport in North America in two categories and tied for second globally in the Airports Council International 2016 Airport Service Quality Awards and was recognized as one of the Top Ten Most Beautiful Airport Approaches by Private Fly for the third consecutive year. In 2016, Billy Bishop Airport was named the world's fourth best airport in Condé Nast Traveler's Readers' Choice Awards. Offering service to more than 20 cities in Canada and the U.S., with connection opportunities to more than 80 international destinations via our airlines’ networks, Billy Bishop Airport is an important international gateway and a key driver to Toronto’s economy, accounting for more than $2.1 billion in economic output each year and supporting 6,500 jobs, including 1,960 directly associated with the airport operations. Billy Bishop Airport is owned and operated by PortsToronto. Billy Bishop Airport (YTZ) is just minutes from downtown Toronto. We’re located at the foot of Bathurst Street. Whether you’re running to or from a meeting or you’re taking a well-deserved break, our convenient location takes the stress out of getting where you need to go. Billy Bishop Airport's hours of operation are from 5 AM to 11 PM daily. Find us on social media for project updates.